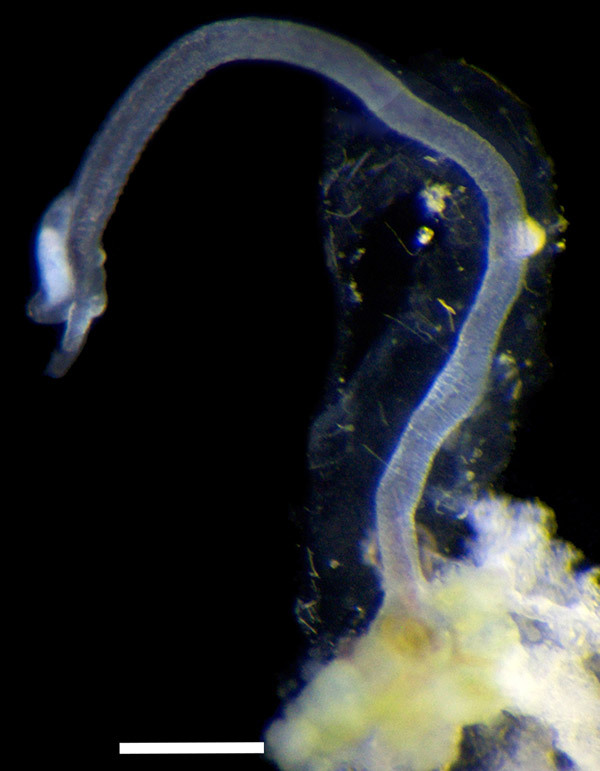 In a new study published in the Dec. 11 issue of Current Biology, marine biologist Greg Rouse at Scripps Institution of Oceanography at UC San Diego and his collaborators reported a new twist to the Osedax story, revealing an evolutionary oddity unlike any other in the animal kingdom. Rouse’s collaborators included Nerida Wilson (formerly based at Scripps and now at the Western Australian Museum), Katrine Worsaae of the University of Copenhagen, and Robert Vrijenhoek of the Monterey Bay Aquarium Research Institute (MBARI). Also surprising was the discovery that males of the new species consume bone on their own, something their dwarf relatives don’t ever do. Adding even more peculiarity to the discovery is the mating process for the new species. Previously studied Osedax male dwarfs are permanently attached to their female hosts, and therefore do not need mobility to mate, so the scientists wondered how the newly discovered males are able to seek out a mate, given their independence. “The evolutionary solution (the new species) found was to actually make the male’s body very extendable so he can reach far out to find females to mate with—he can extend his body ten-times its contracted state,” said Rouse. 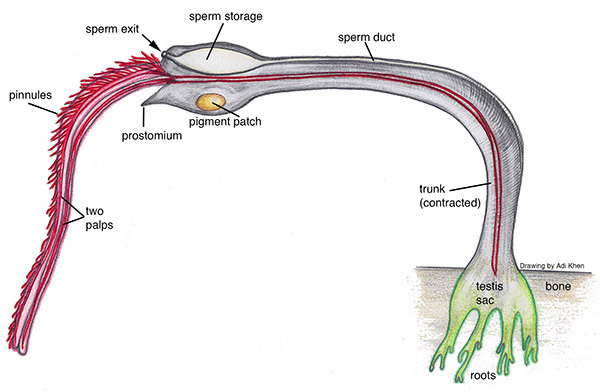 In essence, Rouse said, the entire worm’s body has evolved as a tool for mating, “and that’s why we named it Osedax ‘priapus,’ the mythological god of fertility,” said Rouse. The scientists speculate that less competition for space on certain animal bones allowed the evolutionary introduction of Osedax priapus. Funding support was provided by the David and Lucile Packard Foundation via MBARI, Scripps Institution of Oceanography, National Science Foundation, and the Faculty of Science at the University of Copenhagen.